The Zodiacal Sign of Pisces commences on February 19th, but for seven days, it does not come into its full power until about February 27th. From this date onwards it is in full strength until March 20th, and it is then for seven days gradually losing its strength on account of becoming overlapped by the "cusp" of the incoming sign Aries. In astrology, your Pisces Zodiac sign (also called sun sign or star sign) is decided by the position of the sun at the moment of your birth, as seen from Earth. The sun takes a year to travel through the twelve Zodiac signs, but it’s not exactly a year of 365 days. The time it takes is closer to 365.25 days. That’s why we have leap years. The leap years make the dates of each Zodiac sign change slightly. 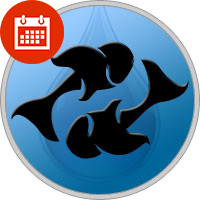 Normally, Pisces starts on February 19 and ends on March 20, but that’s just the mean. In reality it changes slightly in a four year period from one leap year to the next. If you were born on the 19th of February or the 20th of March, you have to check if you’re really an Pisces or not. It never differs more than a day in each direction. The start of Pisces is on the 18th or 19th of February, and the end of it on the 20th or 21st of March. People born on other dates need not be concerned.